BUY TRACKS FROM ALL OF ANTOINETTE'S ALBUMS HERE! LISTEN TO AUDIO SAMPLES HERE! more on a shoe string budget paying artists and overhead. The interview is airing Saturday, Nov. 18 at 11AM (EST) on fusionatsunset.com, then it will air Wednesday night (Nov. 22) at 10PM (EST) on RhythmAndSoulRadio.com. Then it will be available via stream on mixcloud.com. Antoinette performs at her Friar's Club acceptance event. "The Antoinette Montague Experience was the surprise of the APAP showcase. She showed up and showed out infusing enthusiasm among battle weary conference goers, making them sway and swing to her infectious musicality." “Last night I was transported to the vibrant speakeasies and chitlin’ circuit venues of the 1920’s and 1930’s, by the multi-talented and versatile jazz/blues singer, Antoinette Montague who evoked the energy and bravado of the Empress of the Blues, Ms. Bessie Smith. "Your magnificent brilliance on stage always creates a collective aura of magic during your performances. Last night your improvisational presentation captured the audience (as you saw no one wanted to leave!) And I am with you and Ornette Coleman in the belief that music can cure the world - of mental AND physical ailments." "In other words, you were slammin'!!!" Swing, blues, bebop, storytelling, explosive excitement and entertainment–The Antoinette Montague Experience brought the house down Friday night at the Charlie Parker Jazz Festival presented by New York City Parks with JazzMobile in Marcus Garvey Park in Harlem. Evoking great the great Etta’s–Etta Jones and Etta James as well as blues star Carrie Smith and jazz whisperer Shirley Horn, Ms. Montague showed the tremendous range of her artistry. Her commitment to the audience is refreshing and her show is clearly crafted to take listeners on a journey that embraces the power of jazz history without diminishing the fire of the present one bit. With pianist Danny Mixon on piano, there will always be fire next time and together with drummer Bobby Sanabria and bassist Melissa Slocum, the rhythm section was ready for lift off on beat one. The opener Ornithology in honor of the Charlie Parker Festival segued directly into a custom made blues shout for the festival, “Bird’s the word!” The audience was all smiles and ready to party. The horns of Christopher McBride on saxophone and flute and Dave Chamberlain on trombone and flute fleshed out the band to make the Antoinette Montague Experience a stadium level production. The inclusion of artful AC Lincoln as a tap dancer throughout the show, sometimes featured, sometimes tastefully accentuating as a band member not only demonstrated Ms. Montague’s comprehensive knowledge of jazz traditions and the historical marriage of the music and dance, but showed how to successfully integrate a modern tapper into a contemporary jazz show and make more like jazz, never less. The band’s rendition of “Sunnyside of the Street” captured Louis Armstrong’s swing in Antoinette’s soulful voice and combined tempo changes to develop the drama of the moment and unleash the virtuosity of the band. The classic “If I Should Lose You” was a lovely tribute to the seminal Bird recording, “Charlie Parker With Strings.” Montague’s arrangements of songs from the Civil Rights Movement (featured on her CD “World Peace in the Key of Jazz”) resonated well with the Harlem audience who joined in readily on Pete Seeger’s “If I Had a Hammer” set to a danceable African 6/8 and “Ain’t Gonna Let Nobody Turn Me ‘Round” made downright funky! Nina Simone’s spirit was evoked masterfully in the band’s performance of “Four Women” with Ms. Montague truly inhabiting the song’s multiple characters and giving this writer a new understanding and appreciation of the song’s climax, “PEACHES.” She is the everywoman in her own glory. Not the superstar. Not the celebrity, but the true salt of the earth, a perfect antidote to today’s celebrity obsessed and saturated culture. The Antoinette Experience’s closing of Jazz-Woman-to-the-Rescue reminds me of Sun Ra’s forays into audience engagement with costumes and capes. These kind of theatrics bring wide dimensions of the audience into synchronicity where everyone can let go of tensions from the week and celebrate our common humanity. The Antoinette Montague Experience gives us the rare gift of uninhibited generosity of spirit and true optimism that jazz music heals and harmonizes, bringing disparate souls together in this moment. One that could live, if we let it, from this moment on. Antoinette Montague is a jazz singer who is equally inspired by classic tunes and Civil Rights. Originally from Newark, New Jersey, she was the youngest of eight children in a music-loving family. Antoinette is now a professional singer who has won numerous awards. When she is not performing live, Antoinette is busy running the Jazz Woman to the Rescue Foundation which she started to encourage the public to donate their old instruments and art supplies to schools in communities who have no music or art programs. Antoinette advocates, mentors and encourages singers and musicians of all levels and instructs for Jazz at Lincoln Center's Gateway MBA/Music program which invites people from around the world to learn the invaluable communication and group dynamics of a jazz band. Antoinette was a protégé and power of attorney for the legendary Carrie Smith and she was also a protégé of Etta Jones. Antoinette Montague (AM): I loved singing from an early age, 5. I knew at 16 I wanted to be a great singer. AM: I'm the last of eight children with a wide household age span. I liked Louise Armstrong, Duke Ellington, Stevie Wonder, Ella Fitzgerald, Mahalia Jackson, James Cleveland, Dianna Ross, Dionne Warwick, James Brown, Michael Jackson. Jimmie Hendrix, Paul Robeson, and my mother, Pecola Montague. AM: Jazz and Blues of encouragement. Duke Ellington encouraged artists to be beyond category, so I am willing to visit a few tunes outside of jazz, to bring them in and pull the blues or sensibility of swing out of them. AM: People find and invite me, thank goodness, after seeing and hearing me. Actively singing, promoting, getting more daring, delivering the best entertainment and singing from the heart, gets folks inspired to present you to their audiences. Some say I'm one of the hardest working women in NY jazz and blues. I say I'm one of the most grateful ones to get the opportunity and try to maximize it. AXS: How did you get involved with NYC Parks? AM: I have been a regular performer on the great Jazz Mobile Summer Fest. Robin Bell-Stevens connected me to the NYC Parks. She tells the audiences that they will be thoroughly entertained by the Antoinette Montague Experience. AM: Hard to select one. “Good Times Roll” which is a celebration-of-life tune that brings me and the audience together and we party! It's a tie between a song I wrote a prayer/wish for the world, "And So It Is" and the blues “Drink Muddy Water.” I've had requests for “Summer Song” by Dave Brubeck on my CD Behind The Smile that I did a duet with the late great Mulgrew Miller. AM: There are so many. Singing and loving on people throughout the world, Russia, South Korea, Israel... Selling out NJPAC Dorthaans Place and taking people on a musical, jazz, blues and soulful experience that I hope lifts and soothe their soul. Also getting air play on jazz radio everywhere but especially at home in Newark on WBGO; bringing more Love at a time when we need it most. Performing for Jazz Mobile, The Duke Ellington Center for the Arts with Mercedes Ellington, The Urban Leagues Youth Leadership Conference for Jazz at Lincoln Center where I got the privilege of sharing my Civil Rights based music with the young folks, and watching the embrace it, and rein vision it; jazz drama workshop. Helping to start several ongoing Jazz Festivals (The Ridgewood Jazz Fest, Eleuthera Jazz Fest, International Women in Jazz ). That and my board work, advisory board work and new involvement with The Friars as a member. AM: Get to your anointed, spiritual singing and or playing of your instrument. Have a positive message or some real truth to what you have to say in your music without being preachy. Sing or play as much and everywhere you can. Appreciate people and thank people who help you.. Don't forget where you started. Love your family. Appreciate them. Create a community. Let the arts refine you. Be in the musical service to humanity. Be your word. Pay fairly, and ask to be paid fairly. Lift the standard, be the change. Try to honor the elders. Elders love the young, if they'll let you. Try new things. Deal w change. Study and find a supportive and encouraging guide. Listen, listen, listen; Duke Ellington said he was the world’s greatest listener! Open up and connect with your heart and soul! WORK! Run your best race. Try not to compare yourself to other folks. Who knows what they sacrificed they made or price they paid to get there. Perhaps they are obligated to their own mystery. Try not to compare yourself, but it's hard not to measure. We're humans. If you want to be great, keep striving for it. It's your life. Go for it. Nothing comes easy for everyone. Stop complaining about everything. Yes it's hard, but it's worth it. Turn stage fright into stage excite. Take piano. Play the room you are in, not the one you think it should be just on your set list. Entertain the audience, not just yourself or your band mates. Have a mission. Let an anointed loving spirit be your source. It will move and inspire people. Pick songs you love that love you back and work well for you, that have something inspiring to say. Dance! Smile. Dress like you care about the folks coming to see you. AM: Yes The Charlie Parker Festival in NYC, The Antoinette Montague Experience with some of my favorite musicians and fav Jazz Mobile friends I love working with Danny Mixon, Stanley Banks, Melissa Slocum, Bobby Sanabria, Winnard Harper, Solomon Hicks and others. Also, the Fairburn Music Fest on September 23 and the Newark Museum holiday series on December 4. I look forward to more opportunities. World Peace in the Key of Jazz! It’s Valentine’s Day, downtown Newark at Nico’s, the supper club attached to NJ PAC. Dorthaan Kirk, music maven and widow of jazz icon Rahsaan Roland Kirk, presents monthly Sunday Jazz Brunches. Ms. Kirk has just introduced today’s talented musical artist… Antoinette Montague, aka “Jazzwoman” is originally from Jersey and so this is her house today and these are her people, in this sold out room. But she always makes it her house no matter if she’s uptown in Harlem at Minton’s, over the bridge in Brooklyn at BAM, at jazz vespers in church or on tour in Europe or Russia. The crowd and the room become hers because she performs on a level that gives her audience 110%, and then some, anywhere she brings her act. Now, while the chef at Nico’s was busy in the kitchen preparing our buffet brunch, Ms. Montague was on stage serving up a musical feast. First were the tasty hot opening appetizers. Her band, led by Danny Mixon on piano, played an instrumental called Blue Bassa. Then Antoinette hit the stage and belted out a medley that included Blues in G, Havin’ a Good Time in Newark and a rollicking, call and response, with Let the Good Times Roll. She followed that with a smoky rendition of I've Got You Under My Skin. Next came an uplifting serving of Shirley Horn’s signature song Here’s to Life. By adding a little salsa to an old Debarge hit from the 80’s All This Love, Ms. Montague made everyone want to get up and do the cha-cha. From the iconic Broadway musical, My Fair Lady, Antoinette sang us a swinging delicious entré, On the Street Where You Live, that was reminiscent of another sassy singer, the Divine Sarah Vaughn. Sizzling next was a rousing version of Try a Little Tenderness. Otis, did you hear her? And in remembrance of Maurice White, who recently passed, she offered up the Earth, Wind and Fire anthem, September. There were some exotic side dishes too; starting with a little something you might call Hip-Bop rather than Hip-Hop. Antoinette cooked up a jazzy arrangement of rapper Drake’s hit, Hotline Bling. Talk about turning the tables, this table was completely flipped over but it absolutely worked. The rhythm section led by journeyman drummer, Winard Harper, and all-star Stanley Banks on bass gave this arrangement the new groove it needed. The next time that I hear the Drake version, I’ll find myself wishing it was done in Antoinette’s Hip-Bop style. Other side dishes included Horace Silver’s Song for My Father and a prayerful tune that she herself composed, And So It Is. Well, this tasty meal was almost over, so for dessert Ms. Montague donned a golden cape and transformed into her alter-ego, “Jazzwoman.” Using Lavern Baker’s R&B oldie Jim Dandy to the Rescue, as the backdrop, she took us on a tour-de-force journey through jazz history. Antoinette has a program for schools in which she uses “Jazzwoman” to teach students about the history of jazz, the only true original American art form. On Sunday she gave us a pastiche going back as far as Sister Rosetta Thorpe’s gospel song, Didn’t It Rain. Accompanying her on this trip was a young man, King Solomon Hicks, who, on guitar, picked some rockin’ Chuck Berry, Johnny B. Goode licks. Then she gave us A Wonderful World by Satchmo, Louie Armstrong and ended with A Tisket A Tasket from the great Ella Fitzgerald. Finally Jazzwoman took off her cape. The lady has given her audience the aforementioned 110%, and then some. She assumed her true identity and Antoinette Montague closed her show. Then she came down off the stage at Nico’s to press the flesh with her fans, her friends and her family, that had come to this house to see her perform in another room that she had once again, most definitely made her own. Jazz Woman to the Rescue is a foundation in the works. It's historic as it visits Ella Fitzgerald, Louis Armstrong, Duke Ellington and living Jazz Heroes on the band stand. There are 2 elements to the Jazz Woman foundation. "The Play it Forward" program of encouraging people to take old instruments and give them to disenfranchised children. The second prgram is "Put it Back!" The push for citizens to contact local schools in their community to ask if they have an arts education program for their students. If not, we as taxpayers insist they Put it Back! into the curriculum. Jazz Woman to the Rescue helps with donated instruments and assigns a roster of artists to provide low cost musical education in after school programs and/or designated study slots. We are currently reaching out in search of grants and donor funding to enable us to bring these two programs to more schools and children. “My Grandfather said of Ella Fitzgerald that she was 'BEYOND CATEGORY,' and I would like to say the same of Antoinette Montague, that she is 'beyond category.’ "
Thank you so much for your performance. You are a gifted performer. Your diverse repertoire and your audience interaction was very refreshing. We especially enjoyed your spontaneous rendition of ‘Young Gifted and Black.’ You project yourself with such conviction the listener has no choice but to be moved. Your enthusiasm on the bandstand is contagious. We gave a ride to one of Vicki's interns who is from India and a freshman at SU, she had never been to a jazz concert before or exposed to jazz music of any nature. She indicated that she enjoyed it and asked if that was how all jazz concerts were my nephew who is a jazz musician quickly replied "NO" but that's how they should be. Thank you again. We look forward to hearing you live in the near future. But in the meantime, we shall continue to chant "Jazzwoman" to the rescue. SUPERB concert last night at Flushing Town Hall. Thank you so much for making so many people so very happy–and your band is Amazing!!!! Antoinette and her group hit town like a fast freight train and delivered an engaging, high-energy show that showcased veteran talent, Danny Mixon, Chip White, Paul Beaudry, and the best of the next generation, Christopher McBride, Solomon Hicks. Our audience responded in kind – standing ovation. Kudos to the supremely talented Antoinette and the dynamite show that she assembled for our event. Photo credit: Tony Graves. Antoinette Montague Quartet with Danny Mixon at a sold out performance at Dorthaan’s Place at New Jersey Performing Arts Center, March 2014. Click here to see Antoinette on WBGO's photoblog. 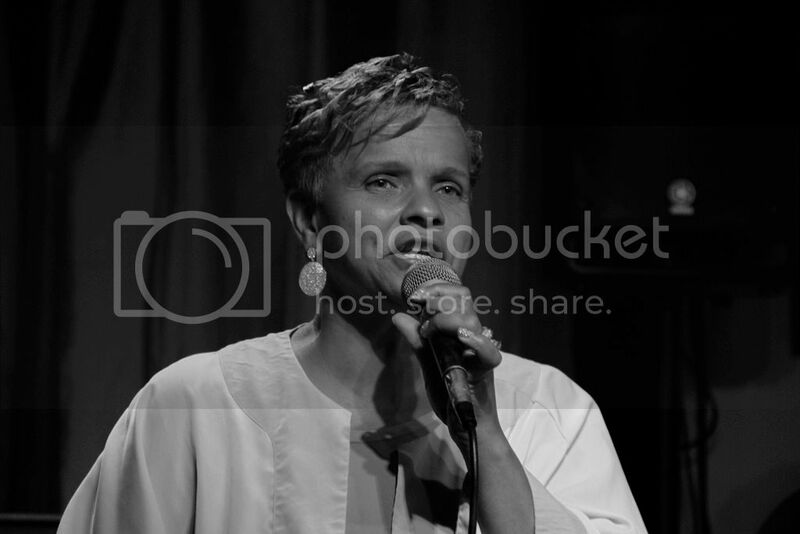 Click here to read coverage of Antoinette's triumphant return gig at the Central New York Jazz Arts Foundation Black History Month Cabaret in Syracuse. View John Herr's Picasa photo album of Antoinette's performance at the Sheraton University Ballroom, February 13, 2011 here. Click here to see Antoinette interviewed by Jackie Lennon on "Jackie & Company" Friday, April 8, 2011 12:30 am. Time-Warner Cable CH 67/69, RCN CH 85, Verizon CH 36.